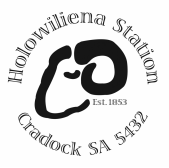 Holowiliena Station: Outback History, Live! Holowiliena / [hollo-will-eena] / n.
​Scottish derivative of the Aboriginal word oola-oola-wool-anna, meaning “Old Man Kangaroo Rat and his Nest”. now open for pre-booked history tours. gaining an insider's glimpse into the past. "Visiting Holowiliena was the highlight of our trip to the Flinders Ranges. The amazing history of the station is brought to life through the carefully restored buildings and remarkably preserved remnants of a past era. Luke and Frances’ passion and enduring connection to Holowiliena Station give it a special feel and makes for a very memorable experience."